Mirage is a naturally occurring optical phenomenon in which light rays are bent to produce a displaced image of distant objects. A mirage is extremely noticeable when observed through optics, such as a spotting or sniper scope, since light rays actually are refracted to form the false image at the shooter or observers location. Cold air is denser than warm air, and therefore has a greater refractive index. As light passes from colder air across a sharp boundary to significantly warmer air, the light rays bend away from the direction of the temperature gradient. When light rays pass from hotter to cooler, they bend toward the direction of the gradient. If the air near the ground is warmer than the air higher up, the light rays bend in a concave, upward trajectory—something we commonly see through our rifle optics. In the case where the air is cooler on the ground or near the ground than the air higher up, the light rays curve downward. There are three types of mirage: inferior, superior, and Fata Morgana. Precision shooters typically encounter the inferior mirage. The inferior mirage is also known as the highway mirage, or desert mirage, and looks as if water or oil is on or near the target. With inferior mirages, the target’s image is distorted. It may be vibrating, vertically extended (towering), or horizontally extended (stooping). If there are several temperature layers, several mirages may mix, perhaps causing double images. Another type of mirage that precision shooters may encounter is known as barrel mirage. Barrel mirage occurs as the rifle barrel heats up, typically when the shooter fires an excess of 10-15+ rounds without a sustained break in-between shots. The barrel mirage will occur faster when the shooter uses a suppressor. When you shoot on a hot day and your rifle barrel gets hot, the heat rising from the barrel can make the target waver around. The fix to this problem: a simple barrel or suppressor cover, or a small strip of cloth placed over the barrel/suppressor. TabGear© makes an awesome suppressor cover that is used by the U.S. military, special operations, law enforcement, and civilian precision-shooting community. The TabGear© suppressor cover is designed to prevent mirage from obscuring your sight picture after multiple shots through the use of insulating materials. The outer shell of the cover will not heat up, so your equipment and person will not become damaged with accidental or intentional contact. With the use of the cover, the precision shooter/sniper can easily remove the suppressor or change barrels without injury. How often have we been on the range where mirage is prevalent, and while looking through the scope, no matter what power setting the scope is on, the target appears to jump from its point of origin? Mirage moves the apparent location of the target, mostly upward, so that if the shooter was to aim and shoot at the center of the target, the bullet impact would be high, possibly missing the target completely. Although there is a horizontal problem that we will encounter, the greatest displacement in bullet impact will be in height. If there is wind crossing the mirage (which, more than likely, there will be), the target will appear to also move left and right in addition to the upward motion. If there is a lot of wind, the target may also appear to completely disappear behind a wall of water vapor. This will present a problem, especially for those who need to make that first shot count. As discussed earlier, when the shooter is shooting in a heavy mirage, the shot placement will be high on target, or a complete miss. We need to determine where the target actually is, not where it appears to be. When observing a target through a mirage, whether the mirage would be classified as heavy or light, take a look at the target. To reduce the density of the mirage seen through the scope, reduce the magnification on your optic. If you are utilizing a rifle scope with power settings that exceed 15X, take the power level down to a setting of around 10-12X. While looking at the target through this setting, the target may appear more clearly. If the target still appears to be “jumpy” or shifting, there is a general rule of thumb used in order to prevent shots impacting high or missing altogether—indexing the target. That means finding/locating the target’s point of origin through the shift and change of the mirage. Since our target is stationary at its base (not leaving the ground), we can find its point of origin even while looking through the mirage shift. In order to find the target’s point of origin, we need to first determine the direction of the mirage, or the way the mirage is blowing in relation to the ground. If the mirage is moving in an upward manner and at a slight angle, the target will appear to be higher and left or right of where the target actually is. Once we find the direction of the mirage, we may begin locating the target’s origin. This is done by first finding the corner base of the target that is nearest to the mirage’s base. This can be somewhat of a challenge to find, depending on the density of the mirage. If the target is jumping/shifting in the mirage, the shooter will notice a “constant.” The constant is where the target corner will always shift to through the mirage, while the remaining portions of the target will vary in space (top sections of the target are never consistent in space). The shooter can use a point of reference behind the target to determine where the target’s consistency lies. Once the target’s actual point of origin is determined, the shooter may then, in his mind, impose the mirage target onto the point of origin. This becomes easy with practice, especially if the target dimensions are known. The shift in the bullet’s desired impact, depending on the density and consistency of the mirage, can vary anywhere from .1 to .8 MILs when mirage has not been taken into consideration. The sight corrections needed to compensate for a mirage, at a given range, will increase as the density of the mirage increases. The shooter should be able to distinguish between different densities of mirage, which can also be recorded in a data book for future reference. For precision shooting, we can use three categories to classify the mirage density: light, intermediate, and heavy. The light mirage is associated with a cool or cloudy day, when the sun cannot heat the ground and is seen through the spotting scope as a series of fine, faint lines. Target distortion is minimal. This mirage is very useful to the shooter in detecting slight wind changes which require the merest pinch of windage adjustment; while the mirage correction is practically negligible. An intermediate mirage will be present on the perfect shooting day with 70 to 75 degree temperature and normal relative humidity (45 to 55 percent). The mirage is barely perceptible with the unaided eye, but is easily seen through the spotting scope as distinct lines. Target distortion begins to become apparent and each major change in wind velocity will also require a correction for the change in mirage. Conditions are more difficult than those brought about by a light mirage, but are not the most difficult. 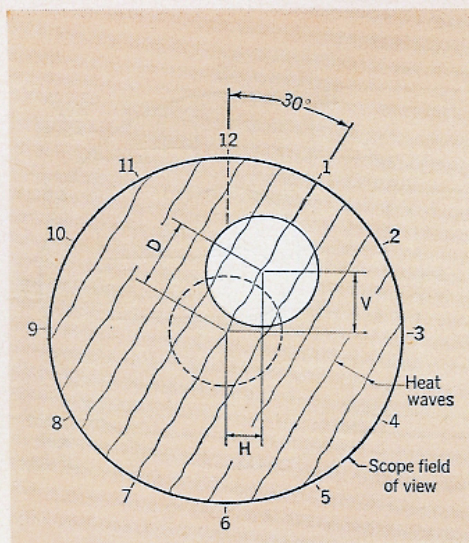 A heavy mirage will occur on hot, sultry days (60 to 75 percent humidity) when heat waves can be seen easily with the unaided eye, and appear as very dense lines viewed through the spotting scope. Target distortion is extreme, small bullet-hole spotters are difficult to locate, and any change in the wind velocity will require that the shooter take into consideration the mirage corrections. How can you calculate mirage? A slow mirage exists during a light air of 1-3 mph blowing from 3 o’clock or 9 o’clock. The heat waves will be slightly inclined as they move across the target from 7 o’clock to 1 o’clock, or from the 5 o’clock to 11 o’clock. The target displacement with the slow mirage requires both an elevation and windage correction. Since the heat waves are crossing from 7 o’clock to the 1 o’clock, or the 5 o’clock to 11 o’clock, they are making an angle of 30 degrees with the vertical, and their vertical and horizontal components. Experience has shown the total displacement due to heavy mirage amounts to ≈ 1 ½ minutes. The vertical correction due to heavy-slow mirage will be 1.31 or 1 ¼ minutes, and the horizontal correction will be 0.75 or ¾ of a minute. Going back to the total displacement of 1 ½ minutes caused by the heavy mirage, the vertical correction for a heavy-medium mirage will be 0.75 of ¾ minute and the horizontal correction will be 1.31 or 1 ¼ minutes. The elevation turret is lowered and the windage correction is added to that required for wind drift. Target Displacement: “D” and is oblique 30 degrees. Nick Irving is a former U.S. Army Ranger with multiple combat deployments to both Iraq and Afghanistan. During his service within the 75th Ranger Regiment, Nicholas served as an Assaulter, Heavy and Light Machine Gunner, and Designated Marksman.